Sleep is one of those areas in life where you want quantity and quality. There are multiple studies on sleep and the majority tend to agree on a few basic things. Firstly, human beings need a good consistent number of hours per night, ideally around seven or eight. Secondly, when we are sleep we also need a good quality of sleep, which means spending the right amount of time in each sleep stage, and getting through a good number of sleep cycles. More on all of these points below. I’ve also written a follow up article on practical environment, behaviour and diet hacks to improve sleep. Why do we “need” these things? Well, sleep is an anabolic state that allows our body to recover and recharge, by replenishing energy and regenerating tissue. If you’re O.K. with being tired, grumpy and generally not living your waking hours to your full potential, then you needn’t read on. However, if you want to understand your sleep, in order to optimise it, operate at your maximum capacity on a daily basis, and feel damn good doing so… then I am here to help you. If you need a bit of encouragement then here are some of the negative risks associated with poor quality sleep; a rise in cortisol levels and increased inflammation, high blood pressure, potential insulin resistance, weight gain, diabetes, cardiovascular disease, and mental illness. Sounds pretty bad right? And all that just from not sleeping well. It’s pretty obvious that sleep is critical for general health, cognitive function and performance. Yet it’s really shocking how badly we sleep in the modern age. So, let’s take a look at the science of sleep and the underlying reasons why you may not be sleeping particularly well. You may have heard of a “body clock”. This is your circadian rhythm. It is controlled by the suprachiasmatic nucleus (SCN), a small region within the hypothalamus that regulates a biological processes such as body temperature, heart rate, blood pressure, digestion, and the production of chemicals such as melatonin, serotonin and cortisol that influence how awake and alert or how sleepy we feel. These processes ebb and flow daily over a twenty-four hour cycle, primarily responding to light and darkness that will turn on or turn off certain functions. Altering light and dark cycles can impact circadian rhythms which can in turn have an influence on a number of bodily functions. An out of sync or abnormal circadian rhythms have been linked to a variety of disorders including sleep disorders, obesity, diabetes and depression and other mental disorders. But when all is functioning as it should be this is why under most circumstances we sleep at night and are awake during the day. Turning specifically to our topic of sleep, our circadian rhythms are the key driver in determining our sleep patterns (and also to some degree the quality of our sleep). As it gets darker we produce a hormone called melatonin. Melatonin is the chemical that makes us sleepy. Our brain receives information about external light levels via our eyes. As it gets darker, our body clock (via our brain) tells the SCN to produce more melatonin, making us feel sleepy and telling us that it is time to go to bed. This is important to reference as it feeds in to the upcoming topic around our sleep cycles and getting quality of sleep. In an ideal world we are living in accordance with our natural circadian rhythm as per our ancestors. Going to sleep when it gets dark and waking when it gets light. However, these days we face challenges that our ancestors did not; from jet lag to blue light (from our phone screens or electric lights). These are things that can disrupt circadian rhythms with negative impacts as outlined above, including severely disrupting sleep cycles. When it finally gets around to sleeping, we can divide sleep into two stages, orthodox sleep and rapid eye movement sleep (REM). You alternate between these two stages many times throughout the night and they can be distinguished by monitoring brain waves via an electroencephalography (EEG). We spend around 75% of sleep in orthodox sleep. And orthodox sleep can be subdivided into three non-rapid eye movement sleep (NREM), called N1, N2 and N3. When you are awake an EEG will predominantly show low and infrequent beta waves. Through meditation we can increase the prominence and synchronicity of alpha and theta waves whilst still awake. There are a number of benefits of doing so (increased serotonin being one of them), but that’s probably a topic for another article. Instead, let’s take a quick look at each sleep stage. This is the transition phase from being awake to being asleep. It is typically associated with low frequency, high amplitude alpha waves (8 to 13 Hz) that become synchronised, and as N1 sleep progresses we see an increase in even lower frequency and higher amplitude theta waves (4 to 7 Hz). It is very easy to wake someone from N1 sleep. This is the stage that can be equated with “drifting off to sleep) and in fact when waking people from N1 sleep they may not even realise that they have been asleep. Typically this is a short phase that quickly leads into N2 sleep. This is where the body starts to properly relax into a deeper state of sleep, and breathing and heart rate begin to slow. Theta waves are still dominant (still in the 4 to 7 Hz range), but they are interrupted by sleep spindles. Sleep spindles are rapid bursts of higher frequency brain waves, that have been associated with benefits in learning and memory. K-complexes are also seen during N2 sleep. These are very high amplitude brain wave patterns, potentially in response to external stimuli. So, there’s a lot going here! N2 sleep could be considered our “normal” or “intermediate” state of sleep, as throughout our nightly cycles we will typically spend about half our time asleep in N2 sleep. This is what we would call deep sleep (also known as slow wave sleep or delta sleep). Unsurprisingly in N3 sleep we see low frequency, high amplitude delta brain waves (up to 4 Hz). This is a crucial phase of sleep. It is a regenerative period where the heart rate and breathing drop dramatically and the body is focused on healing and repairing itself. In an ideal situation a first wave of N3 sleep will occur around one hour into your sleep and last up to ninety minutes. Subsequent periods of N3 sleep recur throughout the night, lasting for shorter and shorter time periods, as your sleep progresses. As we will discuss later, this is a critical sleep stage to get the requisite rest and recover to wake up fresh and optimised for daily life. This typically occurs around one to two hours into sleep, cycling around every ninety minutes thereafter. Conversely to deep N3 sleep, REM sleep tends to scale up to longer and longer periods throughout the night. This is the sleep stage associated with dreaming. Our heart rate and breathing become irregular and the body releases chemicals that temporarily paralyse all our muscle systems (with the exception of those that control respiration and circulation) so that we do not act on our dreams. In this stage the brain is very active, and although we are asleep and our eyelids are closed, our eyes move rapidly as if awake. REM is another critical phase of sleep and has been associated with learning and memory functions. Interestingly if people are deprived of REM sleep and then allowed to sleep undisturbed, they will spend more time in REM sleep, suggesting they are trying to make up for lost REM sleep. This is known as REM rebound and it has been suggested that this represents a response to stress by suppressing big or challenging emotional events that occurred during wakefulness. So, that’s how we sleep, and in an ideal world it looks somewhat as per the image above. N1 is our brief gateway from wakefulness to sleep, we soon pass on to regular N2 sleep before dropping into our first deep N3 sleep, coming back out of that into N2 sleep and then our first round of REM sleep. And so that continues throughout the night for around five cycles, with N2 deep sleep periods diminishing in time and REM sleep periods increasing in time as the night goes on. Sadly, if you hook the average person up and run an EEG, the sleep patterns will not look as perfect as the one I have just described. It is far more likely to be scattered and disturbed, potentially lacking prolonged periods of deep sleep and REM sleep and showing multiple instances of wakefulness throughout the night. I’ve already alluded to the potential for disruption to circadian rhythms and poor sleep cycles. But what are the specific reasons that so many people are struggling with their sleep? Primarily we can blame the industrial revolution and all that it spawned. To start with our ancestors used to live without electricity. As such there was far more likelihood of them going to bed near when the sun went down and rising when the sun came up, facilitating a regular circadian rhythm. Our ancestors also would’ve been more active in their daily life from the earliest days of hunting and gathering through to pre-industrial revolution labour on the farm. A tiring but natural life, sending them to bed tired, in need of sleep and in sync with nature. Contrast that to our modern capitalist world. We typically have sedentary, stressful jobs. We have 24/7 access to technology and are therefore constantly bombarded with information and the “need” to make decisions. Our minds are far more “busy” than our ancestors and this creates stress and strain and over activates the sympathetic nervous system and our “fight or flight” mechanism. We also have access to electricity (and many other technologies) that enable us to sleep and wake when we want and not as nature intended. Then there’s the industrial and electromagnetic pollution that permeates our atmosphere and can also have a negative impact on our sleep. So, add together the lack of exercise, overstimulation of our minds and associated stress, pollution and irregular sleep patterns and you have the basis for our modern problem with sleep. Some of these things we can control, and others we can’t, but in all cases we can mitigate the aforementioned negative impacts and create the right physical and mental environment for an excellent night’s sleep. For those of you that have made it this far, and want to dig deeper, I have written a follow up article delving deeper into the best ways to improve your quality of sleep. Below is a brief synopsis, for those who want a quick summary. 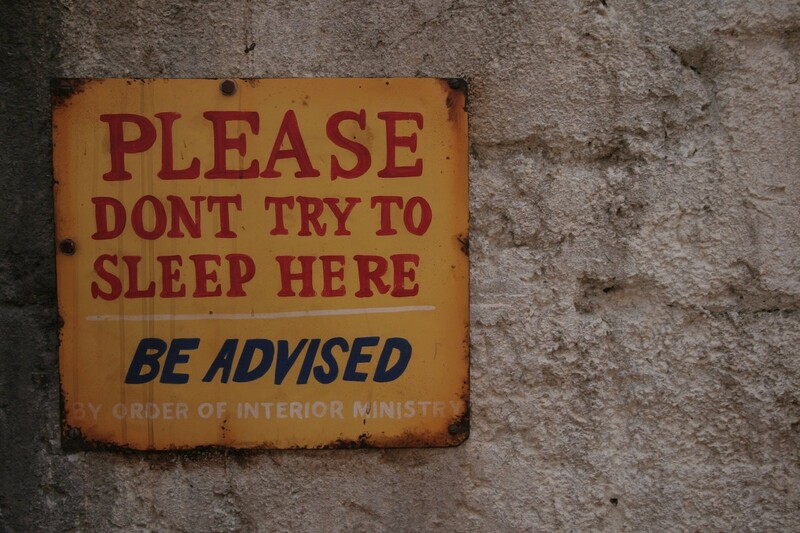 Firstly, optimise your sleeping environment. Make sure your room is dark and eliminate any blue spectrum light from electronic devices and LEDs. Keep your room cool between between 16°C to 20°C, and keep your room well ventilated (consider and air purifier). For comfort, invest in a quality ergonomic mattress. To minimise disturbances, soundproof your room or invest in a good pair of ear plugs. Secondly, rethink behaviour patterns. Keep in sync with your circadian rhythm by exercising and getting your fill of blue spectrum light during the day. Cut out exercise, food, caffeine and alcohol, and reduce exposure at least two hours before bed. Try and respect your circadian rhythm by developing regular sleeping patterns. Meditate and de-stress before bed to help develop a natural sleep cycle. Waking up naturally also supports a balanced sleep cycle. Thirdly, optimise your diet and use natural supplementation to help you sleep better. Magnesium, potassium and zinc have all shown potential to help improve sleep quality. Tryptophan is a precursor to melatonin, or in more extreme cases (e.g. jet lag) you can consider supplementing directly with melatonin. Vitamin D helps to regulate circadian rhythms, and when required, theanine can take the edge off caffeine. It is also worth exploring adaptogenic herbs, such as ashwagandha, which can help regulate the central nervous system (CNS) and induce restful sleep. Most of these things are relatively easy, quick and inexpensive to implement. Just making a number of small adjustments will add up to dramatic improvements in the quality of your sleep. Give it a try, and let me know how you get on. Sweet dreams!